Message Manager is an Administrator's primary tool for managing failed EDI messages with SPS Cloud EDI. Use Message Manager to identify failed messages, inspect message and batch details, and reprocess messages. Message Manager is your starting point for monitoring the status of messages. As of version 91.4, Message Manager comes with a number of usability enhancements to make managing messages easier. Identify messages that have failed, including the details of why that failure occurred. Inspect batch details such as system messages and status. Inspect message details, including the message XML that was sent. Edit message XML with an easy tree editor or text-based editor. Re-process messages, including successful messages. Open Message Manager. Go to SPS Integration > Message Manager. Apply a filter to view failed messages. Select FAILED from the Folder drop-down. Select the desired workflow from the “Type” drop-down. Press “Refresh” to apply the filter. The screenshot below shows an example filter that opens failed 850 Inbound PO messages from April 1st, 2018 through April 11th, 2018. This filtered message list shows 850 Inbound PO messages between April 1st, 2018 and April 11th, 2018. Apply a filter (1-4), then select message (5), drill into the message details (6) or drill into the batch details (7). Success – EDI messages that have been successfully loaded into or sent from SAP Business One. 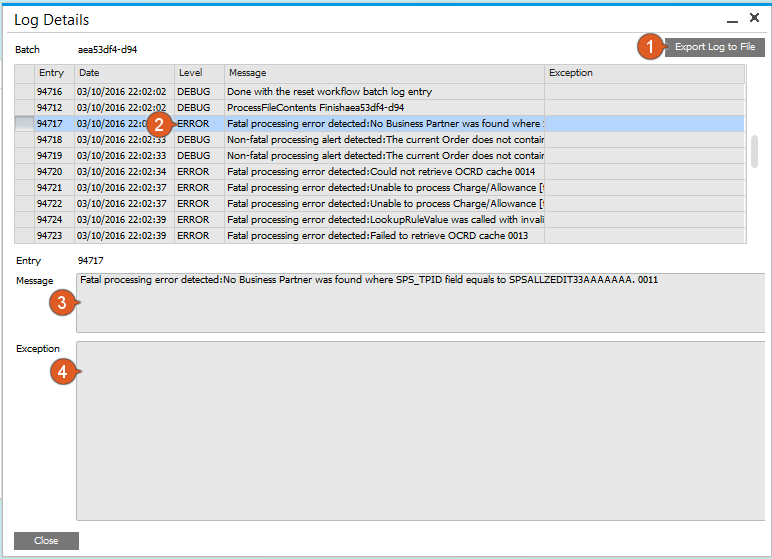 Fail – EDI messages that have failed after three attempts (Retries) to load into or send from SAP Business One. Outgoing – EDI messages in the outgoing queue (Acknowledgements, ASNs and Invoices) to be sent from SAP Business One. Retry – EDI messages that are currently in the retry queue folder. These messages will be processed the next time the Workflow Service runs. System – used for debugging and managing cache – this option will be removed in a future version. All – all message types. 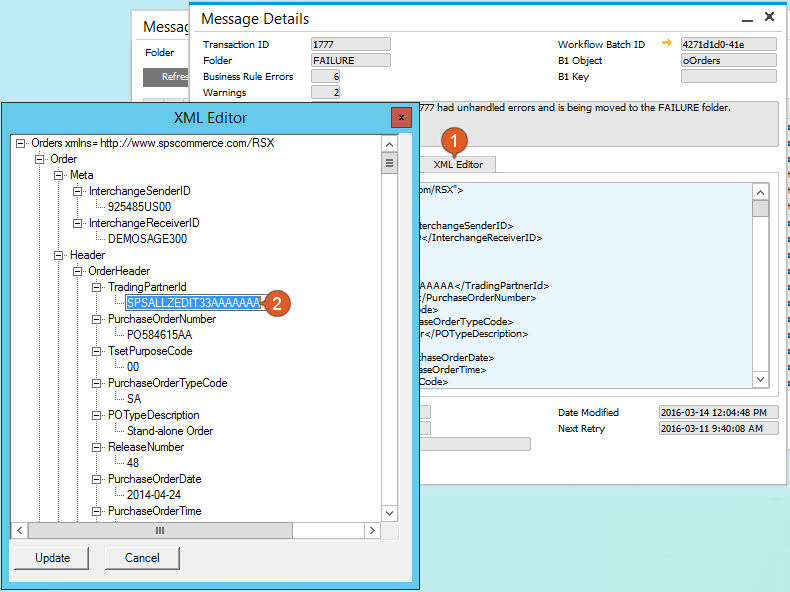 SPSOrder_Inbound – EDI 850 (Purchase Order) messages. SPSOrderAck_Outbound – EDI 855 (Acknowledgement) messages. SPSASN_Outbound – EDI 856 (ASN) messages. SPSInvoice_Outbound – EDI 810 (Invoice) messages. SPS_Operations - used for debugging and managing cache – this option will be removed in a future version. Use this search field to filter by Date Range. Anything processed after this date will be included in the filter results. Use this search field to filter by Date Range. Anything processed before this date will be included in the filter results. When checked, the EDI Message may be sent to the retry queue, if the Retry Selected button is pressed. The Message ID that was processed. Press the golden arrow to open the message details window. Specifies which WorkFlow type the message belongs to. The Batch ID for the batch where this message was processed. Press the golden arrow to open the Batch Log details window. PO - Customer Purchase Order number. Date and time the message was created. Date the message was last modified. This is updated whenever the XML is updated using the Msg ID XML editors. Displays the latest details regarding message processing, such as an error code or success status. Full details may be viewed in the Msg ID golden arrow drill-down. Moves all selected messages into the Retry queue, which will allow these messages to be reprocessed. Inspect the message or batch details, as described in the sections below. To open this batch details screen, on the filter results, open the desired message’s “Batch ID” golden arrow drill-down. See Applying a Filter above for instructions and a screenshot. In the case where groups of messages are processed together, these are grouped in “batches”. Batch logs are displayed to help you investigate a workflow once it has been processed. These log details allow you to identify what caused a message to fail, so that the issue can be resolved prior to reprocessing. First, open the Batch Details from the Message Manager. Use the the golden arrow drill-down in the Batch ID column (see marker 7 in the screenshot below). View details of an error by selecting the error (marker 2 below). The details will be displayed in the bottom section of the Batch Details window (markers 3 and 4 below). Export logs by pressing the Export Log to File button (2). View the details of an error message by clicking on the row (1), then viewing the message (3) and, if applicable Exception details (4). Create a batch log file to archive log details for a batch. This may be required for troubleshooting. From the Batch details screen, you may create an archive of the current batch’s logs. This may be needed by your Vision33 consultant to assist with troubleshooting. To archive log files for a batch, use the “Export Log to File” button (marker 1 in the screenshot above). This will create a log file in the selected folder named <date-time-stamp>_<batch-id>.csv. For example, 20160317-120339-71ece08d-e31.csv was created on March 17, 2016 at 12:03pm (20160317-120339), for batch 71ece08d-e31. You may wish to view individual message details if it has resulted in an error, or if you need to edit XML details for that message. Open the Msg ID of filtered message list to see the message details. If XML details must be updated before re-processing, you may do so from this screen. The message details screen contains info about the status and message XML. Expand the section below to see these details. Message XML may be edited manually or using the simple tree editor. Expand the sections below to see instructions on using either of these editors. The Message Details screen displays details about the message. See details below. A unique identifier within SPS Commerce Cloud EDI for this transaction. This ID is not referenced outside of SAP Business One. The current location for this message transaction. SUCCESS - indicates that this message transaction has been successfully processed. FAIL / FAILURE - indicates that this message transaction has failed to be processed and requires manual updates before it will be reprocessed. OUTGOING - indicates that the message transaction is in progress and has not yet failed or succeeded. RETRY - indicates that the message transaction has failed to be processed, and another attempt will be made to process the transaction. The number of business exceptions related to this message transaction. Errors are exceptions that must be resolved in order to process the message. Details can be found in the Business Rule Results tab in the section below. The number of business rule warnings related to this message transaction. Warnings are exceptions that may optionally be addressed, but will not prevent the message from being processed. The latest system message related to this transaction. It may be an exception or general non-error information. Identifies which batch this message was processed with. The drill-down may be used to inspect batch details for this message's batch. See the section Inspecting Batch Details above. 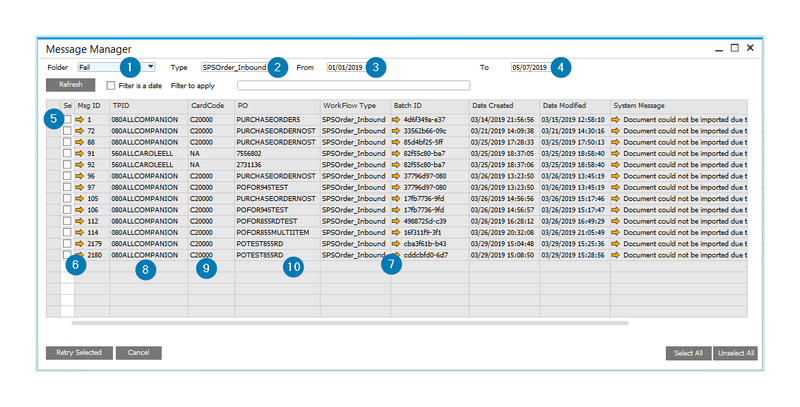 SAP Business One Object type, such as oOrders, oInvoices, etc. 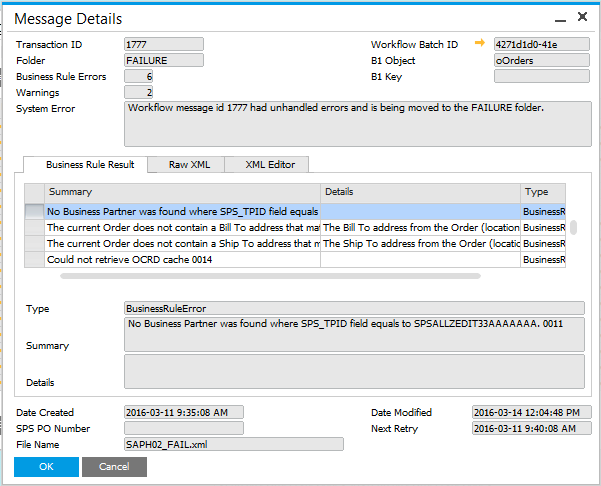 SAP Business One object key, if one exists for this message. In the case of failed incoming messages, this field will be blank, as shown above. Lists all system details, including errors, warnings, and informational messages. Summary provides a brief description of the information. When a result is selected, this info is displayed prominently below. Details provides additional details if applicable. When a result is selected, this info is displayed prominently below. BusinessRuleInfo - Informational detail only. BusinessRuleWarning - Warning that may require action, but will not impact processing. 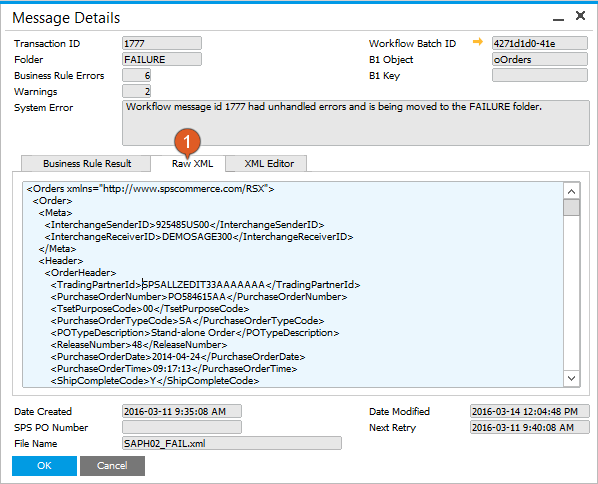 BusinessRuleError - Business Exception that will require intervention before the message transaction can be processed. Displays a text XML editor. See Text Editor for XML (Raw XML tab) section below. Displays a simple tree editor for this message's XML. See Simple Tree Editor for XML (XML Editor Tab) section below. Date when the Message was first created. If applicable, displays the related PO number for this message transaction. The XML file that contains this message's data. This indicates the date of the most recent edit to the XML data, either using the Raw XML or XML Editor tab. This indicates the date and time when the InterConnect Workflow Service will process the batch containing this message. If the message is in the FAILURE folder, this date will not be applicable until it is moved to the RETRY folder. This editor is appropriate if you must edit the XML structure itself, such as adding or removing branches. Edit the XML directly, including the XML structure and data. This provides full access to the message XML, so exercise caution when making this type of edit. Open the Raw XML editor to directly edit the message details and XML structure. This editor is appropriate if you need to edit or review data, but do not need to modify the underlying structure. Open the XML Editor tab (marker 1 below) to open the simple tree view editor. Edit the data by right-clicking on the info you’d like to change (marker 2 below). Note that you cannot edit the structure, just the data. If you need to edit the structure, use the Raw XML editor. Open the Tree XML editor to edit the message text, but not its structure. A message may need to be reprocessed if it has previously failed, or if there is a business need for a successful message to be reprocessed. In some cases, the message XML data may need to be edited, as described above. In other cases, business exceptions may simply be resolved due to changes outside of your control. Apply a filter (markers 1-4, above) and press the Refresh button. Select your desired messages (marker 5 above) and press the Retry Selected button. At this point, your selected messages will be moved to the Retry Queue where they will be reprocessed the next time the workflow service runs. This may take a few minutes, as the workflow service runs on a schedule, as defined in your workflow setup.